Baseball films have always been dominant among sports flicks, and in 2011 we got to see one of the best ever in Moneyball. Hoping to follow the success of that great film is 42, which deals with possibly the greatest story in the history of sports, the story of the man who broke the color barrier, Jackie Robinson. Today, the first full-length trailer for the film hit the internet. I’m very surprised this movie hasn’t been made yet. Robinson’s story is one of the greatest sports stories of all time, not to mention an extremely significant piece of both civil rights history and American history as a whole. Robinson is such a large part of the game that his number is retired by every single MLB team. It’s great to see that this story is finally getting the big-screen treatment it deserves. The last truly great baseball biopic about a player from before the modern era was 61*, which was released over a decade ago. Hopefully 42 can surpass even that phenomenal film. The rest of the cast includes Christopher Meloni, Ryan Merriman, Brad Beyer, Judy Tylor, Jon Bernthal, Nicole Beharie and T.R. Knight. 42 opens April 13, 2013. Check out the trailer and a synopsis below and then head to the comments section to share your thoughts. Warner Bros. Pictures and Legendary Pictures are teaming up with director Brian Helgeland for “42,” the powerful story of Jackie Robinson, the legendary baseball player who broke Major League Baseball’s color barrier when he joined the roster of the Brooklyn Dodgers. 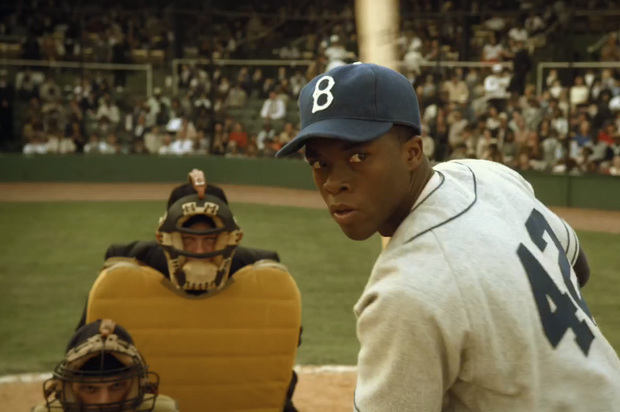 “42″ will star Academy Award(R) nominee Harrison Ford (“Witness”) as the innovative Dodger’s general manager Branch Rickey, the MLB executive who first signed Robinson to the minors and then helped to bring him up to the show, and Chadwick Boseman (“The Express”) as Robinson, the heroic African American who was the first man to break the color line in the big leagues.